Batavia’s significant companies are identified below. Click on any of the names above for the history of the company. The Appleton Manufacturing Company originated in Appleton, Wisconsin, in 1872 by the citizens of that city. The company’s first products were farm implements. The VanNortwick family became interested in the thriving company. In the summer of 1894, the company moved to an abandoned furniture factory on the southern outskirts of Geneva. 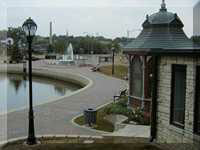 They turned it into a modern plant in a new community they built and called VanNortwick. In 1894, it purchased the entire plant and machinery of the Goodhue Wind Engine Company of St. Charles and added a number of galvanized steel mills to the line of windmills formerly made by Goodhue. 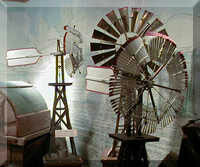 Salesmen carried samples of windmills as they toured the west by train, wagon, and later trucks, visiting farmers and extolling the virtues of windmills made in Batavia. The salesman took an order and telegraphed it back to Batavia. After the mill was manufactured, it was shipped in pieces by train to the customer. It would have to be assembled on the farmer’s land. 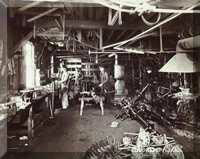 But at 8 p.m., November 14, 1900, two men, were on duty when either a can of naptha or a stove exploded in the paint room. It took off the entire roof and part of a west wall and started a fire. Despite overhead water tanks, the two men were powerless to stop the spread of the flames. All that was saved were the company books and some portable office machines. They were taken to the VanNortwick Block on Wilson Street in Batavia. A few days later, the Batavia Business Men’s Association held a special meeting to make plans to entice the VanNortwicks to relocate in Batavia. They offered the owners $10,000 to move to their city. By mid-December, the company had established its headquarters in buildings on First Street already owned by the VanNortwicks. They worked from these buildings while they built a new plant on the west bank of the river covering nearly 10 acres of land. Employing 300 men, they manufactured thousands of windmills and other pieces of farm equipment until World War II. Most of this plant was razed to make way for Batavia’s Riverwalk. A remaining building was restored for Batavia’s government center, including the police department, administrative offices, and the city council chambers.